Eight persons A, B, C, D, E, F, G and H are born in different months January, March, April, June, September, July, October and November of the same year. They all are like different fruits viz., Apple, Banana, Cherry, Guava, Kiwi, Mango, Orange and Papaya but not necessary in the same order. Only two persons are born between the one who likes Cherry and E, who was born in July. 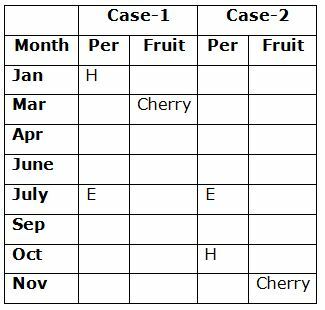 H was born immediately before the one who likes Cherry.Only one person was born between the one who likes Apple and G, who born in one of the months which has odd number of days. As many persons born before the one who likes Apple is same as the persons born after the one who likes Guava.The one who likes Kiwi born immediately after C. Two persons are born between A and the one who likes Kiwi. A does not like Guava. Three persons are born between D and the one who likes Orange. G neither likes Papaya nor likes Orange. As many persons born between F and the one who likes Banana is same as the persons born between the one who likes Papaya and F.
1. 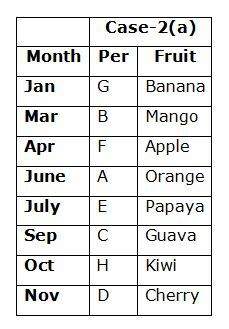 The person who born in March likes which of the following fruits? Only two persons are born between the one who likes Cherry and E, who was born in July. H was born immediately before the one who likes Cherry. Only one person was born between the one who likes Apple and G, who born in one of the months which has odd numbered days. As many persons born before the one who likes Apple is same as the persons born after the one who likes Guava. The one who likes Kiwi born immediately after C. Two persons are born between A and the one who likes Kiwi. A does not like Guava. Three persons are born between D and the one who likes Orange. G neither likes Papaya nor likes Orange. G neither likes Papaya nor likes Orange. 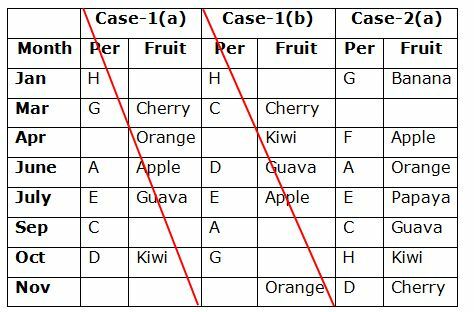 As many persons born between F and the one who likes Banana is same as the persons born between the one who likes Papaya and F.
3. 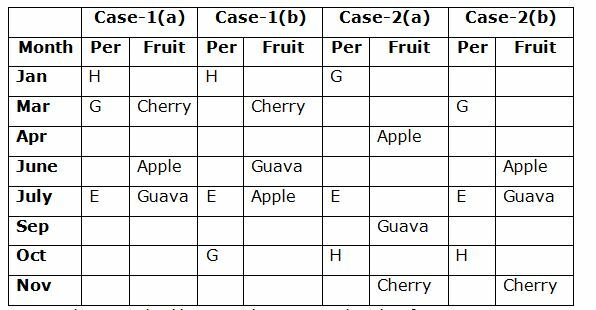 If H is related to Mango and F is related to Guava in a certain way. Then, D is related to which of the following? 4. How many persons are born between H and the one who likes Apple? 5. Who among the following persons is the youngest? 6. If all the numbers are arranged in ascending order from right to left, then what will be the difference between the numbers which are second from the both ends? 7. If ‘2’ is subtracted from all the even numbers and ‘4’ is added to all the odd numbers. Then how many of the numbers will be divisible by ‘7’? 8. If the first and the second digits in the all numbers are interchanged and then arranged in ascending order from left to right. Then, which of the following will be the sum of the digits of the number which is exactly middle after rearrangement? 9. If all three digits are arranged in ascending order within the number and then the numbers are arranged in descending order from left to right. Then, what will be the difference between the second digit of third number from the right end and third digit of second number from the left end? 10. If ‘2’ is subtracted from each even number and ‘3’ is added to each odd number in the number 4258361, then how many digits will appear twice in the new number thus formed? 1) The person who born in March likes which of the following fruits? 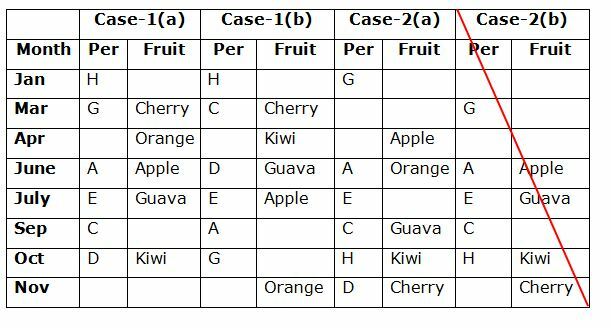 3) If H is related to Mango and F is related to Guava in a certain way. Then, D is related to which of the following? 4) How many persons are born between H and the one who likes Apple? 5) Who among the following persons is the youngest? 6) If all the numbers are arranged in ascending order from right to left, then what will be the difference between the numbers which are second from the both ends? 7) If ‘2’ is subtracted from all the even numbers and ‘4’ is added to all the odd numbers. Then how many of the numbers will be divisible by ‘7’? 8) If the first and the second digits in the all numbers are interchanged and then arranged in ascending order from left to right. Then, which of the following will be the sum of the digits of the number which is exactly middle after rearrangement? 9) If all three digits are arranged in ascending order within the number and then the numbers are arranged in descending order from left to right. Then, what will be the difference between the second digit of third number from the right end and third digit of second number from the left end? 10) If ‘2’ is subtracted from each even number and ‘3’ is added to each odd number in the number 4258361, then how many digits will appear twice in the new number thus formed?